At Niagara Plastic Surgery & Laser Centre, we believe in contributing to society in more ways than just plastic surgery. ST. CATHARINES — Reading has provided ongoing chapters of joy in the lives of the Huq family. They’ve found intellectual refinement, academic achievement and discovery between the pages. “Libraries are very special to our family,” said Dr. Sarah Danial, speaking at a Saturday event marking her family’s donation to the St. Catharines Public Library. Emphasizing this, Danial recalled her fondness for the written word while growing up in Edmonton. “Whether it was a walk to the local bookmobile we used to have at the local school, or a trip to the ... branch at the basement of our favourite shopping centre, I knew a treat was in store for me. “My mother encouraged my siblings and me to read all the time, Danial said. The donation ceremony took place at the new branch at 425 Carlton St., now named the Dr. Huq Family Library Branch in tribute. Danial, a psychiatrist, is married to Dr. Nasimul Huq, a Niagara plastic surgeon. The family of boys Musa, Easa and Yousuf lives in Niagara Falls, but plans to relocate to Port Dalhousie. They have lived in the region since 2001. Nasimul had similar influences living in Cape Breton that gave him a life-long devotion to books. “The library is the delivery room of ideas,” he said at the event. “It’s where history comes alive.” The Huq speakers also stressed that their Muslim faith stresses education and charity, so the donation was a natural fit given their reading passions. Nasimul urged others to make giving and donating to the community part of their lives. The family is also now a patron of the new branch, located in the same building as the St. Catharines Kiwanis Aquatics Centre at Carlton and Niagara Sts. Several local notables attended the event and praised the family for their generosity. “We were extremely grateful and encouraged by their support,” library board chair Les McDonald said afterward. The Dr. Huq Family Library Branch at Carlton and Niagara Sts. is a 7,500 square-foot open-concept branch, offering a wide variety of print and digital resources. The facility includes quiet reading areas, computer workstations, study carrels, a separate children’s area and dedicated program room. It didn’t take long for Musa Huq to find his next page turner. His trip to the library on Saturday wasn’t a regular one, however. While the Huq family spends hours each week at the library, this time it was to be recognized for a $200,000 donation to the St. Catharines Public Library. 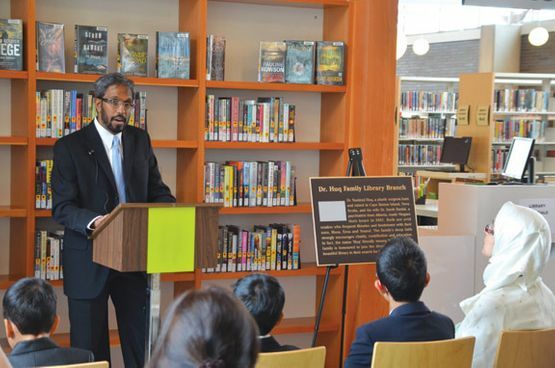 A celebration took place at the former Grantham branch of the library — now named the Dr. Huq Family Branch in recognition of their donation. “Books are the closest thing to our heart,” Dr. Sarah Danial told a crowd gathered for the celebration at the library, noting Musa, one of her three sons, already had a book tucked under his chair, ready to take home with him. Danial said she and her husband, Dr. Nasimul Huq, both grew up with a passion for reading and books. She said they recall trips to the library, or the local bookmobile, and said reading was an important part of their lives, and now an important part of the lives of their children — Musa, Eesa and Yousuf. “Libraries are special to our family,” she said, adding the library is “still my haven” as the psychiatrist is currently studying law at University of Toronto. “I hope there will be many great ideas that come out of this,” Huq said. The family made the decision to donate after reading about naming opportunities at the new library, which opened last summer. Danial and Huq said part of the decision was based on their Muslim faith. One of the five pillars of Islam, said Danial, is charitable giving. “It was an opportunity Nasim and I could not resist,” she said. Huq, whose family lives in Niagara Falls but is moving to Port Dalhousie, said he hopes the donation serves as a model to others to give back. Lilita Stripnieks, chief executive officer of the St. Catharines Public Library, said the library was “very grateful” for the family’s support, and were pleased when they came forward to donate towards the branch. Located with the St. Catharines Kiwanis Aquatics Centre, the branch features a variety of print and digital resources, computer work stations, study carrels, a children’s area, a fireplace lounge area, quiet reading areas with a fireplace and a dedicated programming room. Saturday’s celebration recognized the Huq family, but there are two other contributors who have been recognized at the branch. The fireplace and reading area, along with the programming room, were also identified for naming rights. The programming room was named after Jane E. Munro, the chief librarian of St. Catharines Public Library from 1973-82. Munro was librarian in charge of the Centennial branch that was constructed downtown at 54 Church St. The reading area and fireplace was named after Mary Elizabeth Hecker. The library has also received some donations for its Friends of the Branch program and will be creating donor plaques to recognize the contributions. The Grantham Branch of the library has a new name. 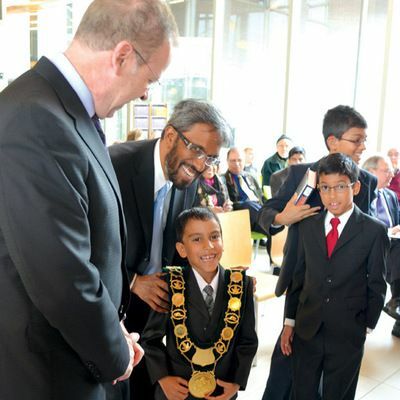 The library branch, which opened its doors last summer at the St. Catharines Kiwanis Aquatics Centre at 425 Carlton St., has been renamed the Dr. Huq Family Library Branch, acknowledging the contributions of the Huq family, who recently made a significant donation to the St. Catharines Public Library. Their contribution will be officially acknowledged Saturday morning with a special naming ceremony at the library at 10 a.m.
Dr. Nasimul Huq and his wife, Dr. Sarah Danial, made Niagara their home in 2001. Both are avid readers, who make a habit of frequenting libraries and bookstores with their children. They are patrons of the new library branch, a 7,500 sq. ft. open-concept branch, offering a wide variety of print and digital resources. The facility includes quiet reading areas, computer workstations, study carrels, a separate children’s area and dedicated program room. For more information on our philanthropic contributions, please contact our clinic today.